In central Florida, a commute from Lakeland to downtown Orlando can take almost two hours. It’s the same with the drive to Tampa. Ease of access is just one of the reasons the local safety-net hospital system, Lakeland Regional Health, recently completed a $275 million pavilion for women and children. A children’s ER within that facility is easing the volume felt by the system’s other emergency department—the busiest in the country with more than 210,000 patients a year. The new facility and its service lines have also attracted new talent and boosted the resources provided by Lakeland’s multiple collaborations, including those with Nemours Children’s Health System and Mayo Clinic Care Network. 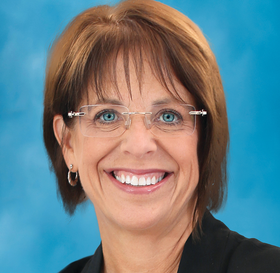 Modern Healthcare Editor Aurora Aguilar recently spoke with Elaine Thompson, president and CEO of Lakeland Regional Health. The following is an edited transcript. MH: What’s the result of these facility and service line changes? Thompson: Since making changes to our ER processes in 2013 and 2014, we’ve seen maybe 80% of people who come into the ER are either back at their homes or in one of our beds in less than three hours. Four executives on Lakeland Regional Health’s executive leadership team are doctors and they partnered with the four executive leaders with engineering science expertise to deliver best throughput and care practices that continue to garner national and international attention. These leaders worked together to optimize Cerner applications to deliver value and manage efficiency so that we’re very thoughtful of where people are in their stay and we can make sure that all of our services surround that patient and there are no delays in care. We also have outstanding nurse leadership, and the entire nursing professional group here made a commitment that they would not be doing their jobs if there was someone in the waiting room who did not have a nurse next to them. Since we opened the Carol Jenkins Barnett Pavilion for Women and Children in June 2018, we’ve been able to go to private rooms throughout our hospital. In addition, we’ve seen a 20% increase in antepartum admissions compared with last year. We’ve seen a 13% increase in births, a 22% increase in neonatal ICU admissions. We’ve seen a 47% increase in pediatric surgeries, a 7% increase in pediatric and pediatric ICU admissions and a 4% increase in pediatric ER visits. So you can see our community needed these services. When this community needs something, it is our job to find the creative partnership or the funds to address that need. We partnered with Nemours Children’s Health System to have them help us oversee quality at the pediatric hospital. Mayo Clinic also has chosen us to be one of their partners and I think these two collaborations prove that we provide exceptional care for our smallest patients. MH: But Lakeland received one star in the latest CMS star ratings. How are you responding to changes in that program? Thompson: The star ratings have been shown to be adversely affected by socio-economically struggling areas. We are the sixth- or seventh-poorest suburban county in the country, so the star ratings do not represent the extraordinary care we provide and hopefully CMS will go back and make changes in this methodology. The changes that have been made continue to disadvantage Florida hospitals. A lot of times risk adjustments look at the dual-eligible population and Florida did not expand Medicaid and has a very large elderly population. We are trying to support our patients, who often have no sons, no daughters, no other family members because folks have retired to Florida. And we are unlike a Sarasota or a Cocoa Beach that tend to have higher socio-economic conditions. In our community, we have long experienced a critical physician shortage. Our area is 30% shy of primary care for every 100,000 lives, and that lack of access to quality care is extremely concerning. It’s why we run the largest emergency department in the country. MH: Meanwhile what are you doing to combat that rating? Thompson: We’re trying to fix readmissions and focus on a variety of areas, including continuum of care and access to quality care. The largest initiative we want to work on here is to become a teaching hospital. We would love to have 200 to 250 residents provide care to an underserved community while they’re in training. We have not been able, however, because Medicare determined in 2008 that we had established a cap for the number of residents we could train, as we had accepted a few rotating residents from other programs. So we have worked over the last six years with the CMS to have them reconsider hospitals in a situation like ours. We’re also working on a legislative fix that would allow us to go forward so we could provide post continuum care that would allow us to improve that readmission measure that’s so heavily weighted. Other indicators affecting the star ratings are patient engagement scores and HCAHPS. We had patients telling us they preferred being in a single room, and we took that feedback seriously. We’re very hopeful that with our recent construction, getting people into private rooms will allow our care members to do the best job possible and afford patients greater privacy and appreciation for the care. We’ve already seen significant jumps in HCAHPS scores. MH: In this era of consumerism, are private rooms enough? Thompson: There’s a physical issue of making sure people are in a room that allows for privacy, care and infection prevention. At the same time, we’ve made huge investments in the Cerner EHR and smart technology on beds and physiological monitoring devices going into those units in the new women and children’s pavilion. The patient has the ability to see their schedule on electronic displays. They can see their medication or which team member is providing care for them when they come in. We have wayfinding apps, patient portals and online scheduling. We utilize sepsis crawlers and crawlers over the EHR system, which help identify at-risk patients. We’re very proud of the technology guiding our providers and our consumer-facing technology as well. MH: Why did you end your partnership with Orlando Health after one year? Thompson: Because of the uniqueness of our communities and the different cultures, we decided that we would be better supporting each other but not in a formal relationship and therefore ended our relationship. There was no clinical integration so from a patient perspective, there was no noticeable change.